Without Jacob and Wilhelm’s efforts to gather folk tales from their German homeland and making them popular worldwide, it’s unlikely we’d know Sleeping Beauty, Hansel and Gretel, Rapunzel, or Snow White. Their family was genuinely religious, and they saw the hardships and good times in their lives as being a part of God’s plan. The children were expected to work hard and be good, and they succeeded in this. Their well-developed character became critically important after their father died of pneumonia when the boys were about ten and eleven years old. The family had to move out of the large house with servants to a much smaller house where everyone needed to do their share of ordinary work. There were no government programs to help the poor, so the boys’ mother had to rely on help from her relatives and their father’s small pension to keep the family fed. Though still a child in years, because he was the eldest boy Jacob was now considered the head of the household. He was expected to take care of the money and plan his future to make sure his mother and siblings would be financially secure. The family believed the boys were smart and could do well with more education so they sent them to the lyceum (high school, also known as a gymnasium) in nearby Kassel. This was the first time the brothers were away from home, and they struggled at first. Their early teachers had not prepared them well for a rigorous high school. Their new teachers treated them rudely in the beginning. Most all the other boys came from well-to-do families and had better early schooling. They certainly had more pocket money and time to spend on fun than the Grimm brothers. Jacob and Wilhelm had to do extra work to catch up to the other students. But they succeeded and soon the teachers began to respect their efforts. 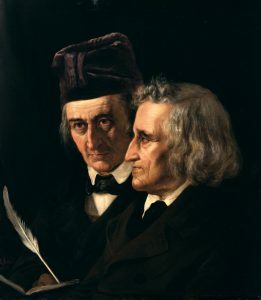 The Grimm brothers were inseparable at school and for most of the rest of their lives. The got up at the same time in the morning. They took their breaks together. They studied together. They went to sleep at the same time. Though the closest of friends, the brothers were very different people. Jacob, the eldest, was serious, introverted, and active. Wilhelm was outgoing and talkative, but he suffered from asthma and was not physically strong. After graduation, their mother wanted them to study law so they applied to the University of Marburg. As he was a year older, Jacob went first. He was turned down when he first applied not because he was a poor student but because he didn’t belong to the right level of society. The university was in the kingdom of Hesse, and the rulers had decreed that since there were too many students applying for the university, only those in the legally defined top seven levels of society could attend. 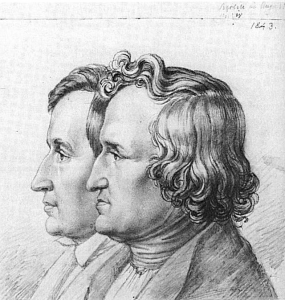 Jacob Grimm, as the son of a magistrate, fell into the eighth level of society so the university refused to accept him no matter how good a student he was. His mother wrote a letter to the Hessian ruler asking for special permission for her son to attend. This was granted, which was good for Jacob’s future but hard on the brothers as it was the first time they had ever been separated. Back in Kassel, Wilhelm became seriously ill and was confined to his room for six months. He was not allowed to read or write, but he was allowed to sketch, and every day his friend Paul Wigand, the son of a university professor, would come to talk with him and keep him company. When he went back to class he not only caught up on the work he missed but advanced beyond what most students were taught in a year. Soon he was ready to join Jacob in Marburg. At Marburg, Wilhelm and Jacob were joined by their friend Paul, who almost didn’t get in either because of his lower social status. The boys were especially impressed by a young professor, Friedrich Karl von Savigny. This professor didn’t give dry lectures and expect the students to copy down and memorize lists of facts. He encouraged them to expand their thinking and gave the brothers access to his library. In those days, free public libraries were not an option so access to these books opened up new worlds for the Grimms. The professor taught them the careful research methods they would use later on when collecting their stories. He taught them the importance of German history and ideas and how these studies were as important as the Greek and Roman studies they learned at the university. They met other writers at who were interested in their country’s heritage at the professor’s house. Later on these writers would claim that they got the Grimms started on their path to fame. The following year, Professor von Savigny went to Paris to conduct research at their national library, and he soon wrote to ask Jacob to join him as his assistant. This meant dropping out of law school and putting off the day when he could be a real support to his family, but Jacob’s mother and aunt agreed to let him do it. When Jacob returned from his work in Paris, the best job he could find was as a clerk in the Hessian War Office. It was boring work, but as Napoleon was on the march with his French army with an eye towards conquering Hessen-Kassel it would soon be important work. When the French took over, Jacob continued working at what was now the French War Office, but he heard about a much better and much less boring position in the royal library. There was new “royalty” in town, as Napoleon Bonaparte had put his youngest brother Jerome on the throne of Westphalia, which included Hesse. Jerome and his queen had about 12,000 books in their library, and they were not very interested in reading. The only other people who were allowed to use the books were the librarian and his assistant: Jacob and Wilhelm Grimm. All too soon Wilhelm developed serious heart problems that demanded he not just stop work but also go to the city of Halle find special treatment. Electric shock therapy was just one of the many torturous treatments he received. When he wasn’t getting strange therapies, he was poring through old books looking for folktales and spending time with his old friends. The folktales they gathered filled a real need with the German people. Having been conquered by the French, they were very interested in preserving their history and their ways of life. Although their first book of folklore, Household Tales was written with an eye towards scholarship, it found another audience with parents and children throughout the land. The Grimms gathered stories - and not just from their library books. They also went out and found storytellers who remembered time-polished tales. These people might be housewives - Wilhelm’s wife Dortchen passed on stories she knew - craftsmen, or servants. They asked their friends for help, too. Paul Wigand, their old friend from their school days, had taken a job as a magistrate which meant he saw a lot of interesting people who had committed crimes in the course of his daily work. Jacob asked him to interview the criminals and take down their “robber songs, superstitions, and sayings” exactly as they said them. Friend though he was, Paul was not very forthcoming with folklore material. It was brothers’ early preference for writing down the exact way that stories were told that made them different from most others who recorded stories during this period. The Grimms wanted the stories told as they had been for years by mostly uneducated people. Jacob and Wilhelm did not want them dressed up with fancy language or rewritten to make them poke fun at political figures as other writers had done. Some of these stories were considered to be too violent for children. The brothers tried to explain to their critics that although many of the stories appealed to children, Household Tales was not really created for them. It was created for the brothers’ fellow scholars and to help preserve the German heritage. But in years to come, some of those early stories would appear in later editions of the book significantly changed to make them more acceptable to children and their parents. A few of the more violent tales were dropped entirely. Older brother Jacob never married. It was outgoing Wilhelm who married Dorothea Wild, the daughter of a pharmacist in Kassel. By the time they wed, they had known each other for fourteen years. Dortchen, as she was nicknamed, couldn’t marry sooner because she had to stay at home for years and help raise her younger brothers and sisters. The couple had several children, and Jacob lived with them and proved to be a loving and caring uncle. The Grimms became world-famous and after a time teaching at the University of Gottingen, they went to live in Berlin. The German people were very proud of the Grimms. As leading citizens, they attended parties with royalty. On their birthdays, people would come to their house to serenade them. Other famous storytellers, such as Hans Christian Andersen, would travel to Berlin to meet them. Besides folk tales, the brothers also collected legends based on true events. They began work on an important dictionary which gave not just the definitions of German words but also showed how they were used. Jacob and Wilhelm only completed a small portion of the multi-volume work before they died. The brothers who worked hard and lived with “their path in the right” were mourned by people the world over. Today, many tourists come to Germany to follow the Fairy Tale Road. They see many of the places where the Grimm brothers lived and were inspired to write down their tales. These picks are some of the most popular tales from the Grimm Brothers, fathers of classic fairy tales. View more books from The Brothers Grimm. Information appearing in this timeline is drawn from Donald R. Hettinga’s excellent book, The Brothers Grimm: Two Lives, One Legacy. A good choice for younger readers is The Brothers Grimm, by Raymond H. Miller. Both books may be checked out from the Central Rappahannock Regional Library.